Creative Company has been chosen by United Way of the Mid-Willamette Valley to manage a brand refresh strategy for the 2013 United Way campaign, which kicks off on October 3, 2013 at the Salem Convention Center. The campaign will reach Marion, Polk and Yamhill counties in Oregon. Randy Franke, a former Marion County commissioner who began as Executive Director for United Way of the Mid-Willamette Valley in December, 2012, initially discussed a messaging strategy with Creative Company’s president, Jennifer Larsen Morrow. After regrouping with his new campaign team, Franke chose Creative Company to carry out the messaging and fresh design into key marketing communications, to establish a visual and verbal brand. Rather than following all of United Way’s messaging, the theme “Live United to the Power of 5” was chosen to bring action to all communications. 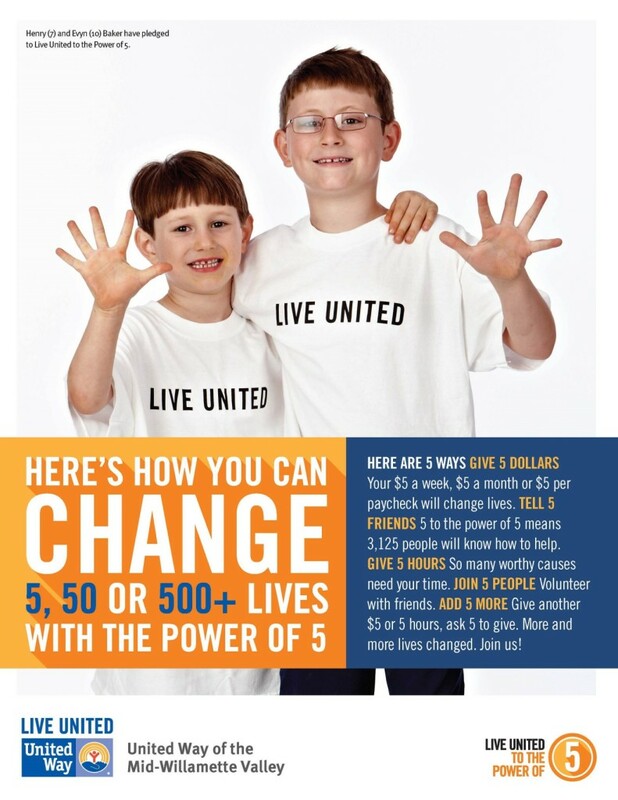 Building on the United Way brand standards, Creative Company designed more visual elements to unify communications. 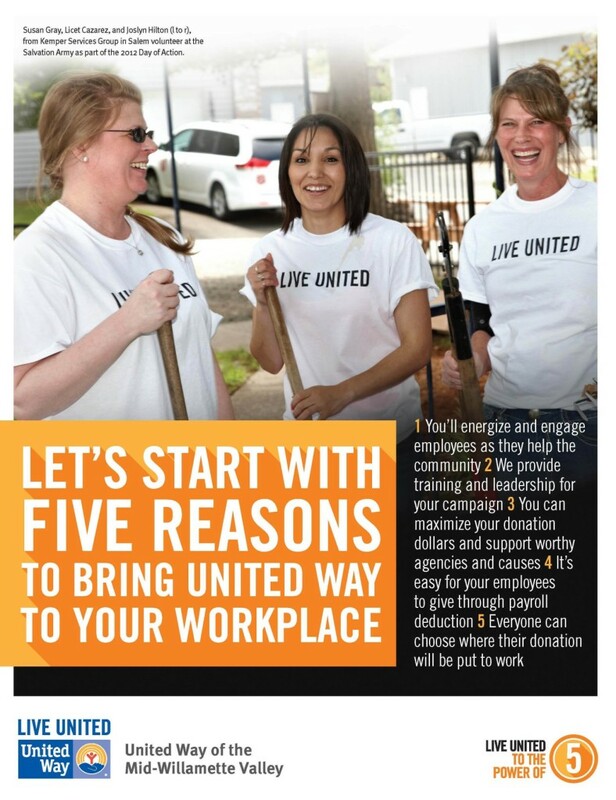 The three areas of focus–Education, Income and Health–used by United Way were updated to focus on the outcomes the campaign aims to meet, rather than the categories of work. These phrases are more descriptive and inspiring for those who want to give time or dollars. 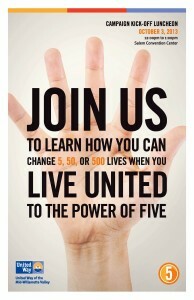 The campaign’s theme, Live United to the Power of 5, builds on the national United Way theme, LIVE UNITED. 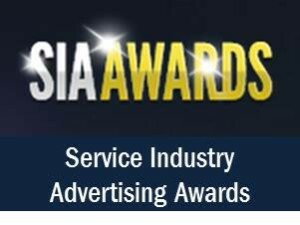 With this brand refresh strategy, national campaign advertising, existing photographs and promotional materials can be integrated into the new campaign. Photos have been shot of this year’s campaign leaders in their LIVE UNITED T-shirts and used in banners, brochures and other marketing tools. Supported by five calls to action—Give 5 Dollars, Tell 5 Friends, Give 5 Hours, Join 5 People, and Add 5 More—the visuals are bold and eye-catching. They use United Way brand colors and fonts to support visual consistency, but add an angled shadow to headline elements for more dimension. From a “save the date” card and invitation for the October 3rd Campaign Kick-off, to brochures for different audiences, banners, updated stationery and easy-to-use templates, a PowerPoint presentation and thank you cards, Creative Company is setting the stage for a five-year theme that will build attention and response. Future work will include a website redesign and added campaign materials. Additional emphasis is being placed on the website and social media, to build younger audiences and give them another way to access information and give their time and dollars. New imagery for the home page and extra pages will be added to the current website before redesigning and launching a new, mobile-friendly website next year. Franke has also established a “President’s Leadership Circle.” Funds raised from membership will be directed towards campaign expenses. 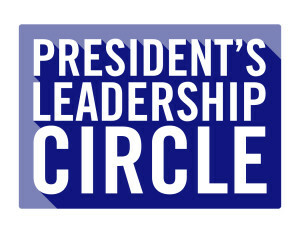 These community leaders will be invited to give advice around strategies to improve results. Inaugural participants will be acknowledged as founding partners. The brand refresh will reach employers and employees throughout Marion, Polk and Yamhill counties. 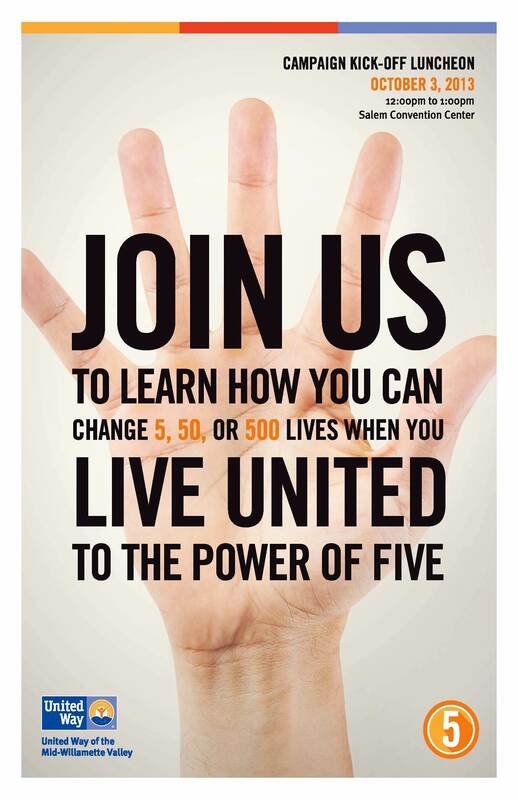 It will also target individuals and volunteers with the message, “Live United to the Power of 5.” The campaign’s goal this year is to raise $4 million, as stated by Executive Director Franke. With strong messaging as the foundation and graphics and photos designed to add energy and excitement, this year’s brand refresh strategy will set a strong foundation for the next five years. For more information about United Way of the Mid-Willamette Valley, call 503.363.1651, email them , or visit their website. To discuss how messaging is the foundation of your visual and verbal brand with Creative Company’s president, Jennifer Larsen Morrow, call toll-free to 866.363.4433, or email her here. Visit our logo gallery to see our work.